As I noted in the previous post, looking for TGS service tickets with RC4 encryption was a good method to discover Kerberoasting activity. Following this line of thought, we can look at TGS ticket requests with specific ticket encryption & ticket options to identify potential Kerberoast activity. Read the entire post for more information on how Kerberoasting works, etc. I note in that post that 4769 events on Domain Controllers are extremely numerous, some of the most numerous events on a network. But, what if we only cared about 1 event? That would reduce the number of 4769 events down to a single event that only occurs when something malicious is happening? This post describes how to further narrow down to best detect Kerberoasting activity on a network: Creating a Service Account Honeypot to detect Kerberoasting. Note: I still recommend filtering 4769 event IDs on Domain Controllers and flowing them into SIEM/Splunk since this will provide information on resources users are accessing as well as help flag when a single user is requesting multiple service principal names (which is suspicious). 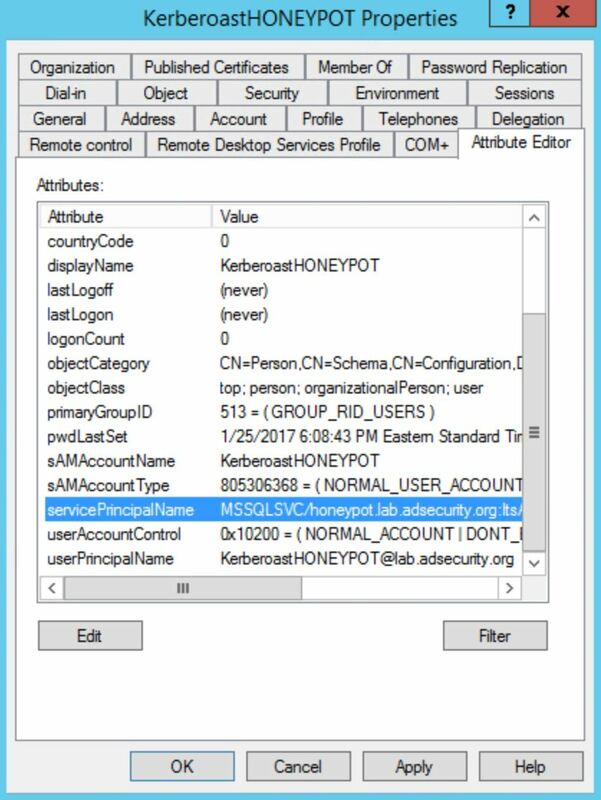 In order to create a Kerberoast Service Account Honeypot, we need to create a user account in AD and give it a fake service principal name (SPN). It has to be fake so we know that when it’s requested, this request is not valid and therefore is malicious. It’s also important to make this account look attractive by setting the “AdminCount” attribute to 1 as this flags the account as potentially having elevated AD rights. Adding this account to a bunch of fake groups made to look like it’s providing additional elevated rights helps to add to the illusion. Step 1: Create a new AD user account. Step 2: Set the “AdminCount” attribute to 1. Step 2: Add a Service Principal Name (SPN) to the account. This SPN needs to be unique, so it should not simply be copied from another system. SQL service accounts are pretty common, so that’s not a bad one to use (MSSQLSvc/sql01.lab.adsecurity.org). Just don’t reuse one that already exists. Step 3: It may also be useful to add the honeypot account to a fake group that looks like it might have admin rights. To make things interesting, you could give this account an easy password that could be guessed, something like “Password1234” (or a keyboard combination). This way we can monitor if someone logs on with this account. 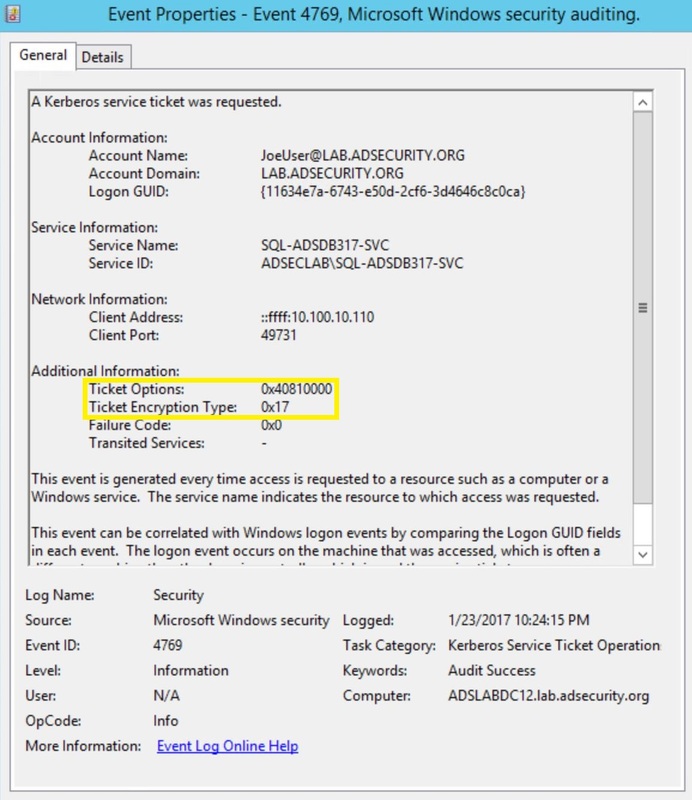 However, the Kerberos TGS service ticket request is enough to know that Kerberoasting activity is occurring and we know from which computer it’s being done thanks to the event information (“Client Address”). Once the honeypot account is created with a service principal name that doesn’t do anything and therefore should never be requested or used. The reason this service principal name should never be requested is that we made it up and it isn’t linked to any real application that would be requesting it. There is no reason for anyone to every request a Kerberos TGS service ticket for this since there is no actual associated service running for it. Therefore, if we see that someone requested a Kerberos TGS ticket, they are very likely attempting to Kerberoast this account. An attacker gains access to the internal network and searches for accounts with service principal names and have admincount set to 1. This shows our new honeypot account to the attacker who is now interested in this account and requests an RC4 encrypted Kerberos TGS ticket for the SPN. A klist shows the attacker got the TGS ticket in memory. By looking for 4769 events on Domain Controllers with the ticket encryption option 0x12 (along with other filters I describe in the Kerberoast detection post), we can see that Joe User requested a Kerberos ticket for a SPN that doesn’t exist and should never be requested! The Account Name shows which account was used and Client Address provides the computer IP from where the attacker requested the honeypot Kerberos service account. 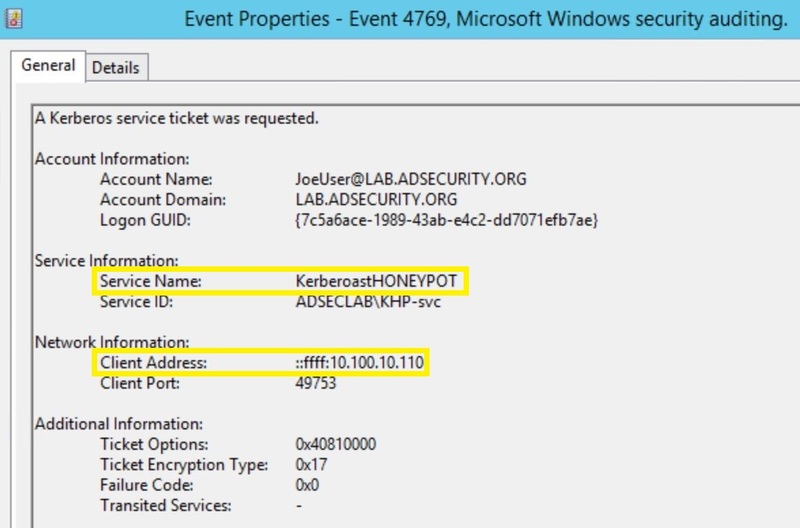 When we use our Kerberoast discovery PowerShell script against the Domain Controller event logs, we find that Joe User has requested a lot of Kerberos service tickets, including the one for our Honeypot (which again should never be requested since it doesn’t exist). Using a service account honeypot, this changes this detection from “potential” Kerberoasting activity, to definite Kerberoasting activity. Note that we can also configure an IDS rule that looks at TGS-REQ packets with the service name “KerberoastHoneyPot” (again, or something more boring and subtle). Kerberoasting requires requesting Kerberos TGS service tickets with RC4 encryption which shouldn’t be regular activity on a network. Logging 4769 events on Domain Controllers, filtering these events by ticket encryption type (0x17), known service accounts (Account Name field) & computers (Service Name field) greatly reduces the number of events forwarded to the central logging and alerting system. Gathering and monitoring this data also creates a good baseline of what’s “normal” in order to more easily detect anomalous activity. 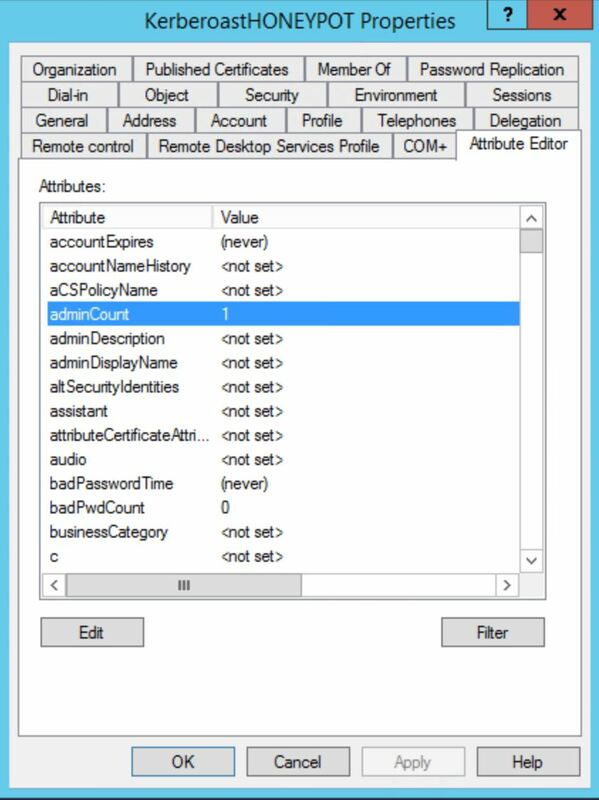 Detecting Kerberoasting activity is possible by logging the correct activity on Domain Controllers. Determining if this activity is malicious is not requires in-depth knowledge of how RC4 TGS tickets are used in the environment. Creating a service account honeypot with a SPN that doesn’t do anything, provides another data point. Any Kerberos ticket request involving the honeypot service account should be seen as malicious.